24: Legacy start Coral Peña tweeted a photo of Legacy’s finale script cover page which reveals that the final episode takes place during the hours of 11:00 P.M. to 12:00 P.M. 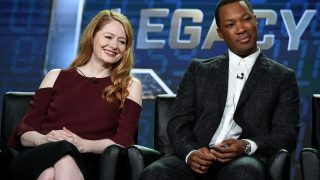 This means that the 24: Legacy finale will span thirteen hours in total. This is similar to the time jump in 24: Live Another Day (which had a singular time jump and spanned the hours of 10:00 p.m. – 11:00 a.m.). The episode was co-written by showrunner Manny Coto and executive producer Howard Gordon and directed by Stephen Hopkins. If for whatever reason the series is not renewed, Hopkins will have the honor of directing the very first and very last episode of the series. So for those wondering how the show would cram a 24 hour day until 12 episodes, you have your answer. I really wish the team could find a way to better integrate the time jumps. That said, I’m glad Howard Gordon is writing more episodes this season. I thought LAD suffered a little as a result of his absence. He’s not been a perfect show-runner over the years (look no further than Season 6), but I don’t think anyone understands the essence of the show better than him. Not 100% sure if Fox is planning to renew 24: Legacy for a Season 2 but I’m happy that the season or series finale whatever it would be is getting a time jump like they did with Live Another Day back in 2014. One little thing: It’s a 12 hour time jump in both LAD and Legacy, not 13 hours. Not sure how ya came up with 13. :) Then both days would end an hour late haha. The way it is in LAD is a precise 12 hour jump. I, too, wish they used the jumps better, such as for getting on a plane to a different location or some sort of thing Eric has to just wait for. That said, I see how random jumps throughout the season would break the tension, so I don’t mind them using it in this sort of epilogue way. Yeah, pretty sure he was referring to how the final episode will cover 13 hours. Yeah, I confusingly realized that too late. Cool that Gordon is finally writing an episode again. It is possible the 13 hour time jump could bring us a Jack Bauer surprise as a flight from Washington to Russia is only 11 hours long! Interesting theory. I think that is probably a long shot (Kiefer is filming a different show on a different network) but that would be a cool ending. Tony ends the last of the cabal, turns around at the click of a gun and there’s Jack. Clock ticks away as they aim at one another. I wonder if Kiefer had time to film the episode? Unfortunately, Howard Gordon categorically denied Jack appearing in this season recently. Yeah, he had time for a few scenes easily, but he 99.99% for sure won’t be. I don’t like the idea of the time jump but I hope they made it more useful than in Live Another Day. Maybe have the characters travel somewhere to track down the final villain and take them down. Fun fact: Gordon & Hopkins also collaborated on the 12th episode of Season 1 (back in 2002), that also ended at 12:00 P.M.
No, it ended at 12:00 A.M. Wait, no, I misread your post. Sincere apologies! I like the fact that this finale, and the one from S1 both begin at 11 PM. If there is a time jump, it could theoretically be sometime after Act 2. So if they were gonna do a shootout in this episode, like the one bet. Jack & the Drazens, it could very easily fall within that same time frame (11:20-11:24 PM). I think the show will get renewed, but if it doesn’t I don’t think that’s the end for 24 altogether. I think we will see the return of the original show, similar to how the Bourne franchise reverted back to Matt Damon as the title character. However, Jack Bauer should not save the world a tenth time… it would become a “mad comic” as Kiefer put it. Instead they should squarely focus on Jack getting revenge on the russians and the relationship with his daughter and Chloe. I would like this format to be called 24 RETURNS – a continuation of the original series, consisting of 12 episodes and being named episodes 205-216. If Kiefer’s current show Designated Survivor gets picked up for a second season, I would like him to sign on for FOUR episodes to be shot between seasons of D.S. to conclude his story. At the same time, we would see the return of many other 24 characters – most importantly Kim, Chase, Chloe, Pierce, Martha, Mandy, Kate and Navarro. After Jack leaves Chase and Kate would become co-leads. If the show does well, more seasons could me made with other veteran 24 characters and even Legacy characters could be brought back too. In one of the tie-in novels set between Day 8 & LAD, Chase died. But in terms of returning characters, I’d love Mike Novick & Tom Lennox. Imo the reason as kiefer put it a mad comic is because jack saved the country nine times already….. if this fails go back to jack have season 10 be about more about his survival & resourcefulness & put the ideas they had for the movie into the 10th season. So let’s say he’s held up in Moscow instead of saving the country why not have the season be about saving himself. He doesn’t have ctu or Chloe. Maybe dive into his connections in the military to eaither aid him or get him back to the states. Keep the story small like in season 1 &2 something to that effect. & then tell some other story related to terrorisim. But for the most part have the theme be about him & his survival in Moscow. & I would by that theory about jack returning which there is not as kiefer as another show which is also not doing great. But that would be one heck of a cliffhanger if we got something on kiefers part. This will be the first season without an ‘A.M.’ in the opening caption! I hope they handle this time jump better than the way they did in LAD. I thought it was a cheap, lazy, cop out to say the show spanned 24 hours. There was no real explanation either before or after as to what to place during those 12 hours. Those last 15-20 minutes just seem like an epiloge. Jack could have swapped with Chole before the time jump. However, it did give William Devane an opportunity to deliver a truly outstanding performance, for which he should have won an Emmy. So, I hope this time they make the 12 hours revelant to advancing the story line. I don’t understand…Jack might appear at the end of 24:Legacy season 1 ?? ?